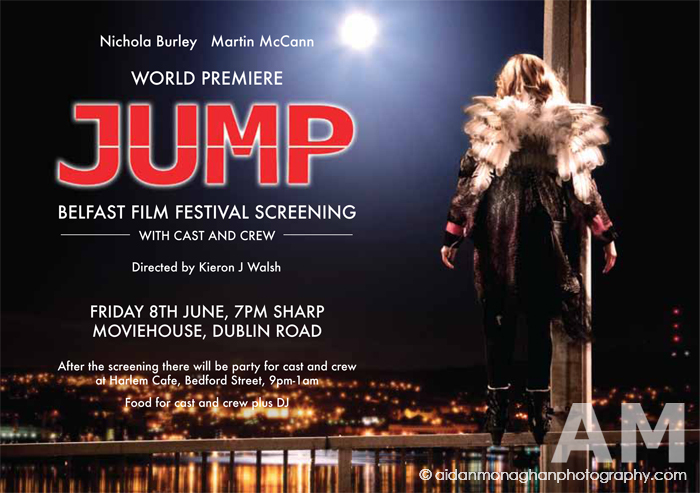 Jump is a 2012 film from Kieron J. Walsh, best known for When Brendan Met Trudy. While his previous film was informed by the French New Wave and the Celtic Tiger, his new, darker film seems much more in the thrall of the American independent cinema of the 1990s and early 2000s. Jump, a typical narrative-bending fashion, delves into two different stories, which occur in slightly different timelines. Memento-like, we see the effects of a particular action before we see the action itself. The plot itself is more by the numbers. Someone has stolen money from a scary gangster Frank Feeney (Lalor Roddy – in everything from Middletown to Hunger, Five Minutes of Heaven, Cherrybomb, Ditching, Sensation, The Good Man and Grabbers). He enlists two men (Richard Dormer – Mapmaker, Puckoon, The Mighty Celt, Middletown, Five Minutes of Heaven, Good Vibrations; and Ciarán McMenamin – Titanic Town, County Kilburn, Sunday, One Hundred Mornings and Outcast) to look for it and the person responsible. Meanwhile, Feeney’s daughter Greta (Nichola Burley) is considering suicide, meeting Pearse (Martin McCann – Closing The Ring, Swansong: Story of Occi Byrne, Whole Lotta Sole, Killing Bono, Shadow Dancer), who has a grudge against Feeney, when he stops her jumping off a bridge. Meanwhile, her two friends (Charlene McKenna – Breakfast on Pluto, Middletown, The Tiger’s Tail, Small Engine Repair, and Dorothy Mills; and Valene Kane – The Fading Light) have a night out in Derry that quickly takes a dark turn. Judging by its influences, the film feels hopelessly out of date, like a film that has spent so long in development hell that it is no longer relevant. The teenage angst coupled with darker and more evil forces and unnecessary and quite irritating stylistics is a direct lift of the dull Donnie Darko while the scary yet funny hit men was a mix of Quentin Tarantino and some of his less successful imitators. As a result, the film jumps from dark angst and suicide to grim violence and remorse via ghostly hallucinations and a comic night out in Derry that goes horribly wrong for two girls. Taken as a single piece, the film is often hopelessly messy, the distancing tonal shifts seeming more like the work of a bored script editor than the writers or director might have intended. The cross-section of up-and-coming Irish actors gamely leap through the story’s many hoops, but they don’t have characters that seem to exist. Consider Martin McCann’s character – an innocent with a dodgy brother, beaten up and angry but brave enough to take his revenge against an evil gangster while also being full of enough cheer to stop a potential suicide and promptly fall in love. It would be disastrous even for a film that had more time to believably develop and introduce these different strands than Jump gives itself. That McCann is at least likeable – and that a cruel twist of fate does appear recklessly cold-hearted on the part of the filmmaker’s – is a credit to the actor’s abilities if not his choices. The rest of the cast are somewhat one-note though their characters could have Inception-like one-word posters. The Party Girl goes from dull cliché to unbelievable plot point – her movements would be out of character if there were a character to being with. Ultimately, too much happens to each character – and each comes loaded with some hang-up or another, which range from believable in the movie-movie fashion to totally unnecessary and fatuous – for them to settle on one particular mode for long enough, except for Roddy, who settles on evil movie gangster and doesn't budge. Time is something that Jump, for all its temporal hi-jinks, seems to have very little of. However, the film, taken as a product of 1995 or 1996, is not terrible, much like the dopey, cruel but quite enjoyable Things To Do In Denver When You’re Dead. Films that played with time were fun for a while but, unlike Tarantino with his current fixation with ‘bad cinema’, we all grew out if it. Jump is dated because it does not offer anything that we haven’t already seen…fifteen years ago. It can be funny and might even be a little moving if you tell your brain to shut up, but it is a film that begs for your involvement and your tolerance instead of just seizing them for itself. It’s the kind of film that tries to convince you to care and whether you do or not, whether against your better judgement or not, is absolutely down to the individual’s tastes and not down to the film at all. Kieron J. Walsh is a fun though hopelessly undisciplined filmmaker. If anything, in the ten-year gap between When Brendan Met Trudy and Jump, he has gone backwards. It is not terrible and it might even be quite good, but why is that enough for filmmakers to make it and audiences to see it. 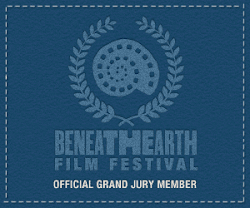 Instead, watch Things To Do In Denver When You’re Dead, a film that feels old because it actually is.